While I was going through a busy point at work with out much time to cook the thoughts of crepes entered my head. I became obsessed with the idea of making them and what I would do with them once I made them. I also for some reason have had a non stick crepe pan that my parents gave me for some reason that I had never used which made making crepes inevitable. 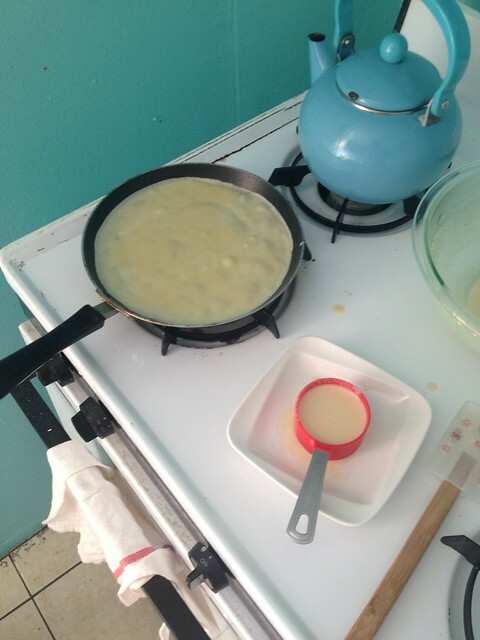 So on my first day off in a few weeks I made some regular crepes and tried some filling combinations that turned out not as great as I planed (that is another post…) but from that cooking session I perfected my crepe technique. For that session I followed the Crepe Recipe from the Good Eats Episode ‘Crepe Expectations‘. Since I now had the crepe technique down I started looking into other things to do with crepes and decided that making a ‘crepe cake’ in a similar fashion to the Gâteau de Crêpes recipe in The Art of French Cooking (Volume 1) by Julia Child was a great idea. 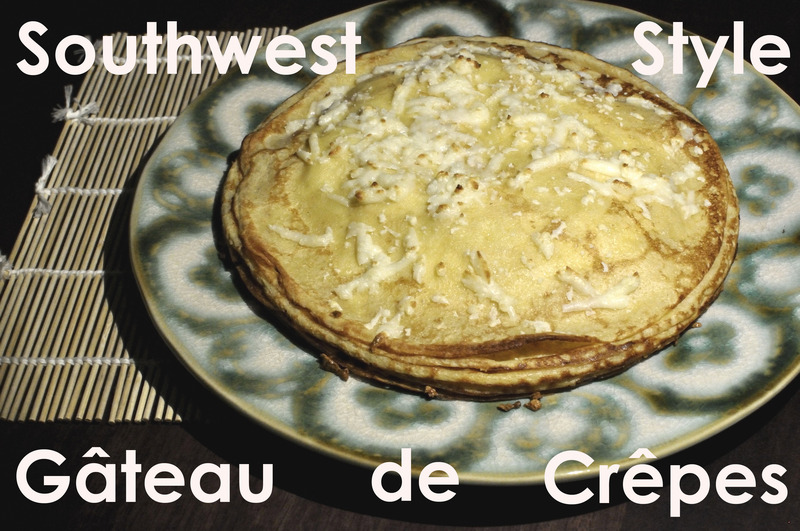 I decided to make my own take on the Gâteau de Crêpes on Mardi Gras aka Pancake Day, that was southwest inspired using my Taco Truck Chicken as one of the fillings. Cover the top with some of the remaining cheese and place in the broiler for about 5 minutes until the cheese is melted and brown. As I was making a southwest inspired meal I thought making the crepes with an addition of some corn four would give them a bit more flavor and make the finished Gâteau a more elaborate riff on a Quesadilla. As I live in a small New York apartment I don’t have a lot of appliances like a blender since I don’tt have room for them but this batter can be made quickly in a blender if you have one. My instructions are for if you don’t have one. Mix the eggs, milk, water, butter, and salt together very well with a whisk. In a separate bowl sift the flours together making sure you remove all clumps, I prefer measuring by weight but if you prefer volume you need a cup in total of flour before sifting. While whisking the wet mix in the dry slowly making sure that the flour is fully incorporated into the wet. Let the batter rest for about an hour in the refrigerator. It is important to let the bubbles settle so the crepes do not gain any volume while cooking. After the batter has rested set up your crepe making station. As you can see from the above photo I keep my mixing bowl with the batter right on the stove with my measuring cup for transferring my batter to the pan near by. Start by preheating your oven to about 200 degrees F and prepare your sheet pan by laying a piece of parchment down and having a clean kitchen towel near by. This is how the crepes will be stored while you are cooking the rest. Right before making the crepes I gently mix the batter with a spoon to make sure that anything that settled to the bottom of the bowl is mixed in. Be careful to not introduce a lot of bubbles when doing this. Grease your pan with some oil or butter and let it heat up on a medium high burner once it is warm (not too hot as it is non stick and you should not let it heat to a high temperature with out something on it) take your pan off the heat in and hold in one and take your scoop of batter (for my pan almost a 1/3 of a cup is the perfect amount) and pour in the middle of the pan and swirl around to coat the whole pan in a thin layer. Just remember the first crepe will always be funny due to too much oil or to cool/ hot of a pan. Place your pan back on the heat and let cook for about a minute depending on the heat of your pan, when you start seeing the edges brown you know you are ready to flip. To flip your crepe there are many ways to do it, as advised in Mastering the Art of French Cooking they suggest 2 spatulas or using your fingers. I failed at both these methods, for me it is just easier to give the pan a good shake and flip the crepe, it takes a little practice by the showmanship of it is fun too. Cook the crepe for about 30 seconds on the second side just until it starts to be a bit spotty brown. Continue until you are out of batter, keeping all the crepes warm in the oven until you are ready to use.